Eyelash extensions are a great way to enhance your appearance, make your eyes look bigger, and save time on your morning routine. That being said, it’s important that you take the time to give your eyelash extensions the care and attention they need in order to get the most out of your lashes. Luckily, at Cherry Lash, our lash artists have years of training and can provide you with extensive instructions on how to care for and maintain your new lash extensions. We offer three base lash extension packages and our artists will work with you to customize the length, thickness, and curl to meet your needs. If you are interested in enhancing your appearance with eyelash extensions, contact one of our convenient locations in Henderson or Las Vegas to schedule an appointment at Cherry Lash today! In addition to not caring for your lashes properly, there are a few mistakes people make when they receive their eyelash extensions that could lead to less than perfect results. In today’s post, we will discuss a few of the most common mistakes people make with their lash extensions so that you can avoid them and enjoy your lashes to the fullest extent. Once your lash artist has applied your new lash extensions, they will provide you with a set of instructions that you need to follow in order to ensure that your new extensions completely adhere to your natural lashes. That being said, it’s easy to become overwhelmed with excitement about your new lashes and forget to listen to the instructions given to you by your lash artist. While you may be excited to get home and take a million selfies of you and your gorgeous lashes, it’s important that you pay close attention and listen to the instructions given to you by your lash artist. One very important instruction that your lash artist will give you is to avoid water for 24 to 48 hours after your appointment. The reason behind this rule is that your lash extensions are bonded to your natural lashes using an adhesive. This adhesive needs time to dry, otherwise, your lash extensions may fall out prematurely. Unfortunately, water and the lash adhesive do not mix, which is why it’s vitally important that you avoid water after your appointment. For this reason, we recommend that those coming in for their lashing appointment shower beforehand. This will help you feel fresh and clean, making it easier to avoid a major source of water until your lashes are completely dry. It’s understandable that you want to come into your lashing appointment looking your best and leave with amazing eyelashes that enhance your appearance. However, you should never come to your lash extension appointment wearing a full face of makeup. In order to attach your lash extensions, the lash artist needs your face to be completely clean and free of any makeup. It’s recommended that you remove your makeup the night before your appointment and wash your face before your appointment. That being said, if you forget to remove your makeup before your lashing appointment, the time it takes to remove your makeup will take away from the time your artist will use to apply your lash extensions. If you have decided that eyelash extensions are right for you, don’t go rushing out to book an appointment with the first salon that you can find. It’s a good idea to take some time, do your research, and find a salon that will meet your needs and expectations. Some lash studios don’t require their lash artists to go through rigorous training, meaning that you may not end up with the best set of lash extensions. If you have friends with have eyelash extensions, ask around to see if they have recommendations or look at reviews online for lash studios in your area. If you live in Las Vegas or Henderson, then Cherry Lash is the lash studio for you. Our lash artists go through extensive training to deliver amazing results that you will love. Whether you simply want to enhance your natural lashes or you want to look like you’re ready for the red carpet, our artists will tailor your lash extensions to meet your specifications. Ready to book an appointment? Contact Cherry Lash to get amazing lashes today! There are many benefits you will experience when you get eyelash extensions, but probably the main benefit is that you will get to wake up every day with gorgeous, thick lashes. Over time, you eyelash extension will fall out as your natural lashes go through their growth cycle. When this occurs, you will need to go to the lash salon and get your extensions refilled. With that in mind, there are a few things that you can do to ensure that your lash extensions last as long as possible. Continue reading below for a few tips on how to care for your eyelash extensions. At Cherry Lash in Las Vegas and Henderson, we take pride in giving our clients beautiful lashes. We offer three different extension options, and then your lash artist will work with you to help you customize the thickness, length, and curl of your new lashes. Whether you’re looking to enhance the appearance of your natural lashes, or you want to look red-carpet-ready every day, at Cherry Lash, we can make it happen! Contact us to schedule your appointment today! Eyelash extensions are attached to your natural lashes using an adhesive. 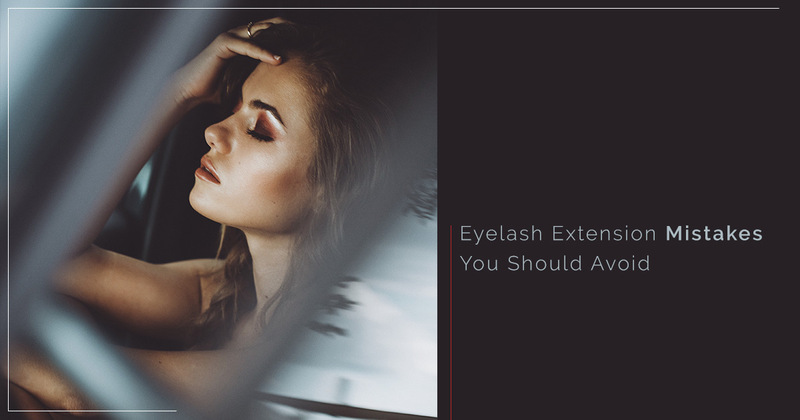 Once you receive the extensions, it’s important that you don’t get your eyelashes wet for the first 48 hours, so as to allow the adhesive time to properly bond with the natural eyelash. 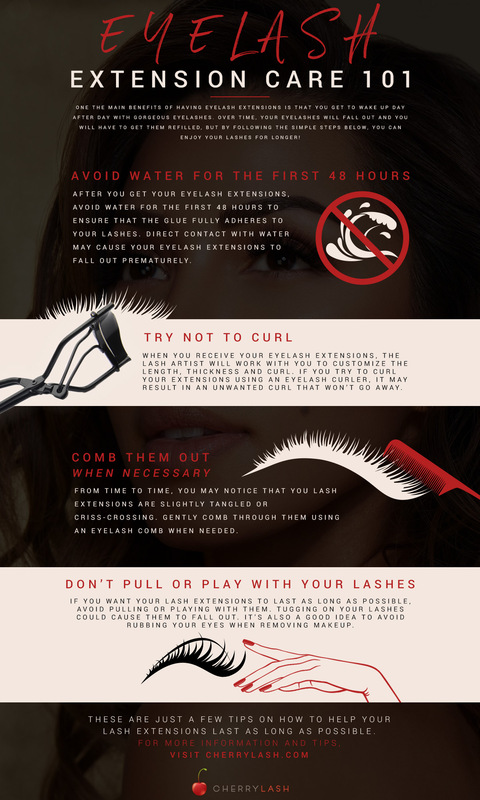 Avoid showering, swimming, and using hot water or steam on or near your lashes until the 48-hour period is over. With your natural lashes, it’s normal to use an eyelash curler to give them a little extra boost of volume. However, with your eyelash extensions, curling your lashes could result in an unwanted curl that won’t go away, or it could cause damage to both your extensions and your natural lashes. Your lash artist will work with you to customize the curl, so if you know that you will want more volume, be sure to talk to your lash artist during your appointment. Every so often, you may notice that your lash extensions are crisscrossing or appear to be slightly tangled. This is common for people who tend to toss and turn in their sleep. If you notice tangles in your lash extensions, gently comb through them using an eyelash comb. It’s important that you only do this when it is necessary, as over-combing could cause your lashes to fall out. Try to avoid any unnecessary touching of your eyelash extensions, such as pulling, rubbing, or playing with them. When you pull or tug on your lashes, you risk accidentally pulling some of your extensions out. The same applies to rubbing your eyes to remove makeup. If you need to touch your lashes, do so gently or use a cotton swab to remove makeup close to the lash line. Properly caring for your eyelash extensions will ensure that they stay beautiful for as long as possible. At Cherry Lash, we strive to provide you with everything you need to look your best and love your gorgeous eyelashes. If you have any questions or you would like to schedule an appointment, contact the Cherry Lash nearest you! With proper care, your eyelash extensions will not only look beautiful, but they will also last for three to four weeks. That being said, there are certain steps that you should take to ensure that your lashes are in good condition. Failing to follow the instructions of you lash artist or neglecting your lashes once they are applied will result in shorter periods between fill-ins and lashes that may not meet your expectations. In today’s post, we’ve outlined a few mistakes that you should avoid regarding your eyelash extensions so that they will look their best and last as long as possible. At Cherry Lash, we want to help you feel confident and beautiful with gorgeous eyelash extensions. You have the option of choosing between our three lash extension packages. From there, our expert lash artists will help you customize your lashes to fit your exact specifications. Are you interested in thick eyelashes that make you look ready to take on the red carpet, or do you want a more subtle appearance that gives your natural lashes a boost? No matter what you’re looking for, the experts at Cherry Lash are here to help! Contact our lash studio in Henderson or Las Vegas to schedule an appointment today. Before your lash extension appointment, it’s vital that you take the time to remove all of your makeup before arriving at the lash studio. You want to walk into your appointment with a completely clean face that is free of makeup. The reason you’re required to take off your makeup is because in order to apply the lash extensions, the extensions need to adhere to your natural lashes. If you’re wearing mascara, the glue won’t adhere as well. Not only that, but showing up with a full face of makeup will also require your lash artist to take time away from your appointment to take it all off, meaning that you may have to pay more for your time or you won’t get quality that you desired. Once you receive your lash extensions, the glue used to attach the extensions will need time to dry. Lash artists typically recommend that you give the adhesive 24 to 48 hours to dry completely, and in that time, you will have certain restrictions of what you can and can’t do. The last thing that you want is to spend two hours or more having your lash extension attached only to have them fall off. With that in mind, it’s important that you avoid water within the 24- to 48-hour period. Water will ruin the glue attaching the extensions to your natural lashes, making them fall off. For this reason, it’s best to avoid swimming, showering, going to the gym, or even steam. Many believe that once you’ve received your lash extensions that you don’t have to do anymore work until your fill-in appointment, however, that is not the case. Although lash extensions make your morning routine a lot faster, there is still a small amount of work that you need to put in to ensure that your lashes last a long time and look their best. You will need to use a lash comb to untangle your lashes each morning, as they will occasionally become tangled during the night. Part of maintaining your lashes also includes going in for regular filler appointments. Your extensions will fall out as your natural lashes go through their growth cycle, so if you want to have continuously fabulous lashes, you will need to have them filled in every three to four weeks. These are just a few mistakes that you should avoid when you receive eyelash extensions. Luckily, if you decide to get lash extensions from the experts at Cherry Lash in Las Vegas or Henderson, you can rest assured that you are not making a mistake and that you are getting lashes from some of the best in the industry. To learn more and to schedule your appointment, contact Cherry Lash today!